Following upon the workshop held as part of the IS-Academy programme RENEW in Amsterdam on Monitoring and Steering of Renewable Energy Programmes in December 2012, a 1-day workshop was organised by ECN and IVM in Maputo on the 7th of May to bring together renewable energy practitioners in Mozambique to gain a deeper understanding of some the issues related to the implementation of energy access projects. More specifically, how can programmes improve access to modern energy services for cooking and household use (electrical appliances) in Mozambique in an effective, efficient and sustainable manner. - Networking and information sharing and dialogue. - Sharing of experiences and identification of key research questions for further research. - Drawing conclusions based on workshop to improve evidence base on effective practices. The full report of the workshop can be found here. A summary report is also available in English and Portuguese. 7. World Poverty Map - Where do people living under $1/day live? 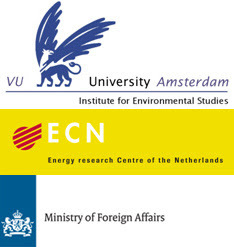 Jos Bruggink recently published an article on the CDKN blog based on his report titled "Energy Aid in times of Climate Change - Designing Climate Compatible Development Strategies". The report challenges the popular 'triple-win' approach of climate compatible development, which aims to encompass mitigation, adaptation, and development objectives simultaneously. Prof. Dr. Bruggink proposes that the traditional divide between solving problems of development and climate change be replaced by an alternate divide between solving problems of rising affluence and problems of persistent poverty. Illustrated in the context of energy aid, he suggests that traditional ODA funding should focus on problems of energy access involving poverty alleviation and climate change adaptation, while new climate change funding should focus on problems of green growth and climate change mitigation. View the article and report, and learn more about the Climate and Development Knowledge Network here. The World Bank e-Institute is hosting an 8-hour e-learning course on Challenges and Opportunities presented by CDM Programme of Activities. The course costs $200 and will be held between February 20 - March 02, 2012. Application ends Monday, February 13. Learn more and apply here. The Modi Research Group at Columbia University recently presented an interactive map representing the total annual building energy consumption for New York City. Users can view estimated data available at the block level. In an interview with Metropolis, Professor Modi pointed out that: “Midtown Manhattan has more energy use than the whole country of Kenya, and New York state uses more energy than all of sub-Saharan Africa.” The research group also works on energy and development, often in collaboration with the Millennium Villages Project. This week, Leonardo Energy and the Clean Energy Solutions Center began a 10-session online course on Regulation and Sustainable Energy in Developing Countries. The course is conducted as a series of 1-hour webinars, and covers topics including: renewable energy and rural electrification policies, feed-in tariffs, cases of massive scale RE dissemination, and cases of successful energy efficiency policies. Click here to view more content and register for the course. The RENEW IS-Academy is a five-year research collaboration investigating energy access and development cooperation in Eastern Africa.